Plan on coming back when we can visit the Park. We loved the cabin. An amazing place, making plans to come back next year. We truly enjoyed our stay at this beautiful cabin. This was our first trip to North Carolina, from the hot desert of Arizona, and the cool weather, trees and waterfalls were a wonderful change of pace. Would recommend Jimmy Mac's for anyone looking for a great local place to eat. Thank you so much for providing this lovely getaway! Loved the cabin. The fireplaces were great after a long day of riding. We rode the Tail of the Dragon, Moonshine 28, awesome falls ( water that is) and the Cherohola Skyway. What a great trip. We recommend the Cork & Bean in Bryson City. Good food & great wine. Thanks for a great time and place to stay. I took this trip with family and friends and everyone loved it... the view from the cabin was wonderful. The cabin location was high enough to look out at the mountains. We wanted a cabin with a lot of windows just for the scenery. tHe cabin had everything we needed far as cooking and other things. We also visited the casino that was about 15-20 mins away not to far. We had a problem with this cabin but we gave them a call and it was fixed within mins. Yes I will visit again. Red Roasted Mini's. We came to drive all your twisty roads! Thank you. We recommend Nantahala Brewing Co in town. Now we're off to go back to Chicago. This cabin exceeded our expectations. We had a great time here celebrating our ten year anniversary. The place is very clean & the view of the Smokys from here is beautiful. We wish we could stay longer. There is no doubt that we will be coming back here. The staff was friendly as well. We had an unforgettable stay here at Sun Eagle. What an amazing getaway. Thank you for making this our home away from home. The view is breathtaking. We couldn't have chosen a better way to spend a relaxing vacation. Thank you for all the things that provided comfort and relaxation. We are already planning our next trip. We really had a blast this weekend. Next time we will definitely stay longer. Staff was wonderful, friendly & attentive. Loved every moment of our stay. Sad to return home. Everything was fantastic and we will definitely encourage more people to come up. Thank you. Very well done. We've lived more, laughed and love your cabin. We would like to thank ya'll for letting us stay at the Sun Eagle. We truly enjoyed our stay. We will be back soon. Interior and exterior of the cabin was wonderfully maintained. 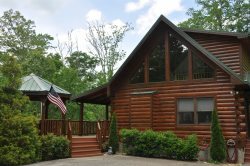 We loved the cabin and the area...we would definitely recommend you to our friends and we would certainly be willing to come again. We all had a fabulous time. This place as so awesome!! Loved the hot tub and the kitchen. The view is so beautiful and The grill was great for steak and pork chops. We are most definitely coming back next year.